Home / Unlabelled / FIFA WORLD CUP RUSSIA 2018 FREE VISA FOR YOU. 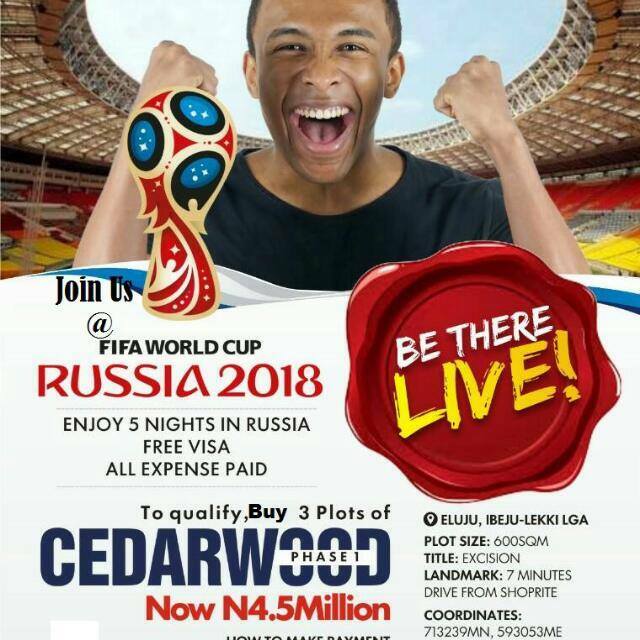 Buy 3plot of Cedarwood Phase 1, Eluju(#4.5m) and get an Apple Macbook Air 13.3" Intel Core I5 (128GB,8GB) - Silver (US Keyboard) Plus win a trip for 5 nights in Russia for the FIFA World Cup 2018, Free Visa and All Expense paid trip. For Enquiries, free inspection and purchase. kindly contact us on +2347062889444, +2348180422501 for any of the Weekdays or Saturday and Sunday(Special request) and you will be booked right away.